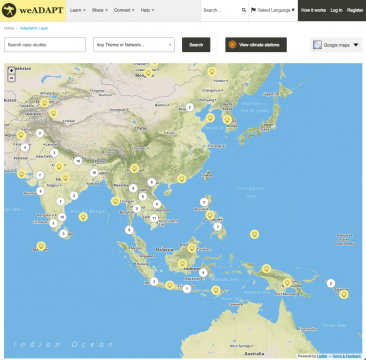 The NEW weADAPT - now at a screen near you! Home › Learn › Articles › The NEW weADAPT - now at a screen near you! 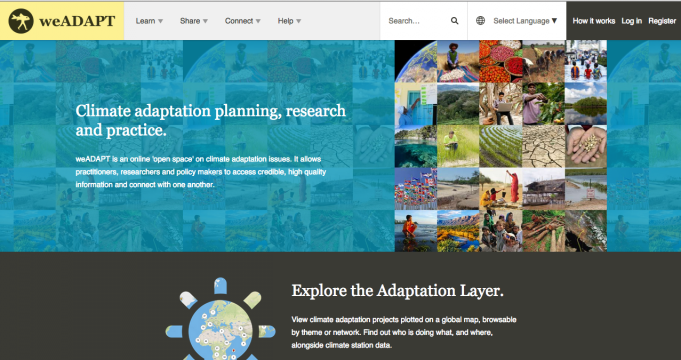 The new and improved weADAPT site has been launched. The platform is not only cleaner, fresher and easier to use, it also has many exciting features, some of which you can read about below. 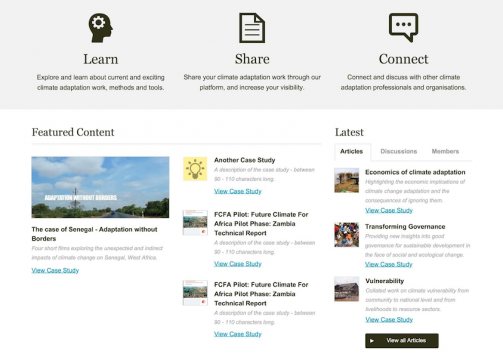 Some of the core principles of weADAPT is further fostered in the new version of the platform. Now there are more spaces for learning and reflection through discussion forums and the ability to comment on content. This allows the co-exploration of knowledge and multi-stakeholder participation on the platform. The platform is recognising the equity and value of different systems of knowledge and is hence providing visibility to this diversity of sources, methods and tools. By blending online participation with offline capacity building on climate adaptation issues through user labs and trainings the platform seeks to build an enduring community of practice. As can be seen below, the new page is following the same basic pattern of - Learn | Share | Connect - but in an improved fashion. Furthermore, both highlighted and latest content is more prominently displayed on the main page in order to create more visibility. This is highly beneficial for active users, since their work will be promoted on the main page as well as through social media channels and our fortnightly newsletter. Latest content is found easily on the front page as well as highlighted articles and case studies. 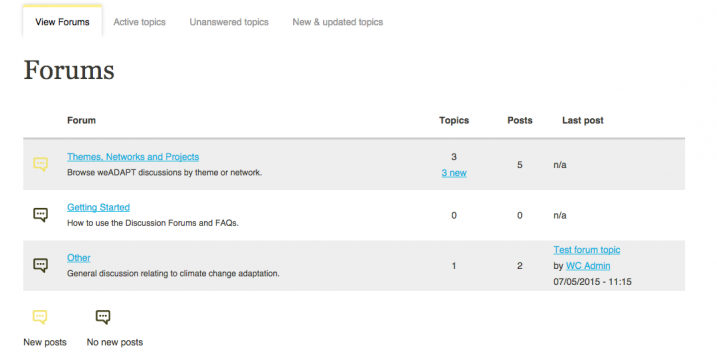 The new weADAPT platform will also host discussion forums where users can interact and discuss important adaptation topics. Any registrered user can start a discussion, and we hope this eagerly awaited feature will be a nice addition to the new site. 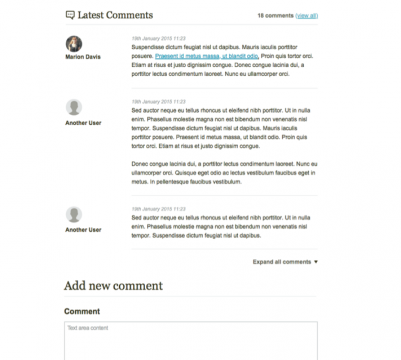 Another feature of the new site is the 'commentary' function. Under each piece of content you are able to post comments and questions. We believe this improves the interaction between users even more and along with improved user profiles, helps you connect with adaptation researchers and practitioners all around the world. In the new site the user is able to provide comments under articles and case studies as shown in the sample above. Unique to weADAPT is the link of climate data relevant to adaptation actions on the ground - the “Adaptation Layer” map - as a result of the collaboration with the Climate Information Portal (CIP) developed by the Climate Systems Analysis Group (CSAG) at University of Cape Town. This enables co-creation of knowledge, creativity and innovation, as users can see climate data in a social adaptation context, and to find data to support research, project planning or policy design in a specific location. The Adaptation Layer (see image above) is course staying and the user will still have the option to add the climate station data to the map layer and sort case studies according to Themes and Networks. We are very excited about the new site, and hope you are too! Please send any feedback or wishlist requests to info@weadapt.org.